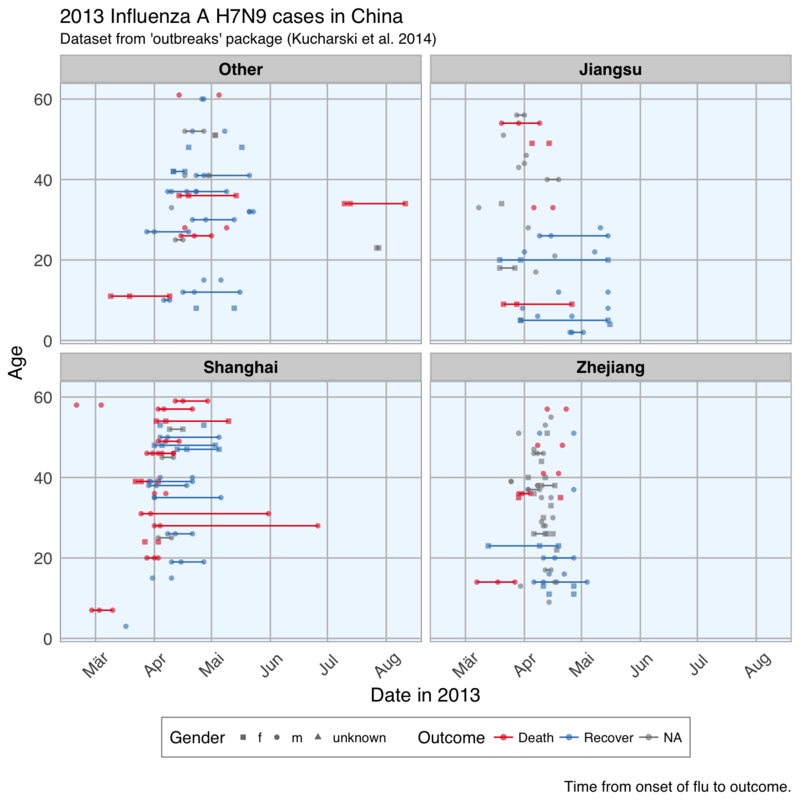 Update: Can we predict flu outcome with Machine Learning in R? Since I migrated my blog from Github Pages to blogdown and Netlify, I wanted to start migrating (most of) my old posts too - and use that opportunity to update them and make sure the code still works. Here I am updating my very first machine learning post from 27 Nov 2016: Can we predict flu deaths with Machine Learning and R?. Changes are marked as bold comments. A. Kucharski, H. Mills, A. Pinsent, C. Fraser, M. Van Kerkhove, C. A. Donnelly, and S. Riley. 2014. 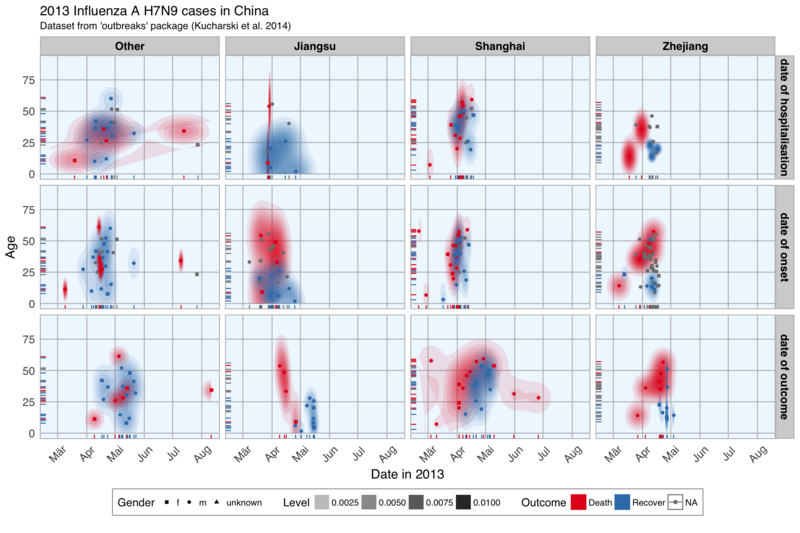 Distinguishing between reservoir exposure and human-to-human transmission for emerging pathogens using case onset data. PLOS Currents Outbreaks. Mar 7, edition 1. doi: 10.1371/currents.outbreaks.e1473d9bfc99d080ca242139a06c455f. A. Kucharski, H. Mills, A. Pinsent, C. Fraser, M. Van Kerkhove, C. A. Donnelly, and S. Riley. 2014. Data from: Distinguishing between reservoir exposure and human-to-human transmission for emerging pathogens using case onset data. Dryad Digital Repository. http://dx.doi.org/10.5061/dryad.2g43n. I will be using their data as an example to show how to use Machine Learning algorithms for predicting disease outcome. 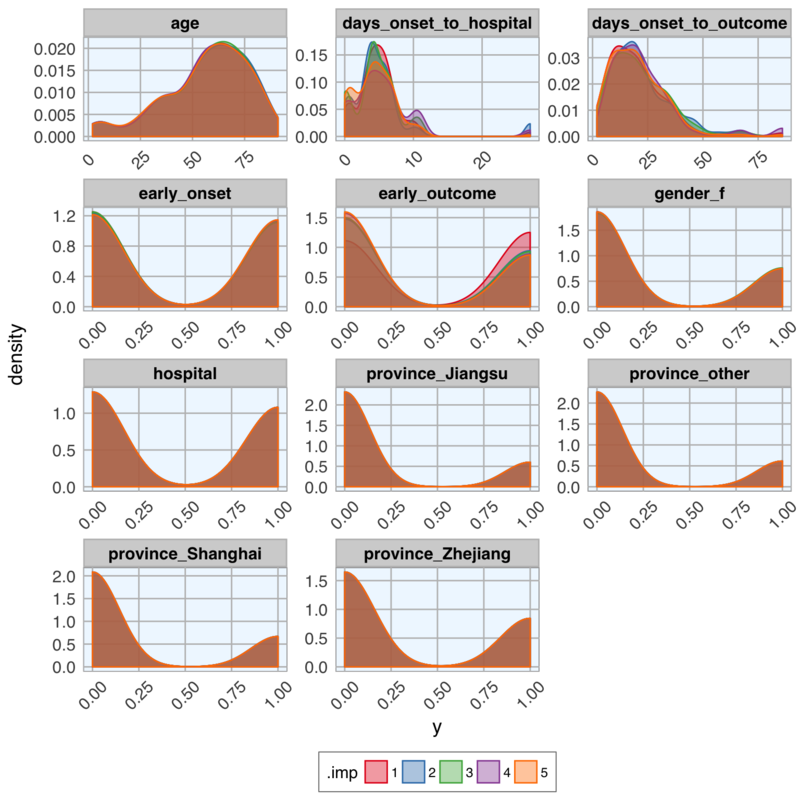 The dataset contains case ID, date of onset, date of hospitalization, date of outcome, gender, age, province and of course outcome: Death or Recovery. Change: variable names (i.e. column names) have been renamed, dots have been replaced with underscores, letters are all lower case now. Change: I am using the tidyverse notation more consistently. caption = "\nTime from onset of flu to outcome." In machine learning-speak features are what we call the variables used for model training. Using the right features dramatically influences the accuracy and success of your model. For this example, I am keeping age, but I am also generating new features from the date information and converting gender and province into numerical values. Note: Since publishing this blogpost I learned that the idea behind using mice is to compare different imputations to see how stable they are, instead of picking one imputed set as fixed for the remainder of the analysis. Therefore, I changed the focus of this post a little bit: in the old post I compared many different algorithms and their outcome; in this updated version I am only showing the Random Forest algorithm and focus on comparing the different imputed datasets. I am ignoring feature importance and feature plots because nothing changed compared to the old post. Now, we can go ahead with machine learning! The dataset contains a few missing values in the outcome column; those will be the test set used for final predictions (see the old blog post for this). The remainder of the data will be used for modeling. Here, I am splitting the data into 70% training and 30% test data. Because I want to model each imputed dataset separately, I am using the nest() and map() functions. To make the code tidier, I am first defining the modeling function with the parameters I want. Next, I am using the nested tibble from before to map() the model function, predict the outcome and calculate confusion matrices. Hope, you found that example interesting and helpful!